For those of you who recall my emboldening tabby travails of a year ago, you might be surprised to hear that I ran into the same problem of keeping a consistent tabby this time, also. Sigh. The inconsistent tabby problem is due to the fact that I had an odd number of ends at the turning points in the pattern. I foolishly didn’t bother to check this. 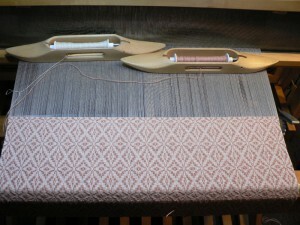 After I settled on a threading that I liked, I just derived the treadling based on the twill pairs in the threading. Then I counted the total number of picks in a repeat, and since that was even, I figured my tabby would stay consistent. I actually think the cloth looks very nice anyway, but I have figured out a new treadling that should solve the problem, and will see what difference it makes in my next piece of cloth. 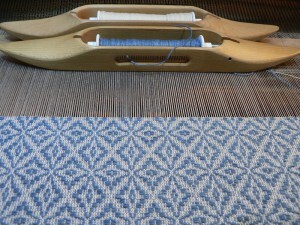 Here is a portion of cloth on the loom using woad-dyed 22/2 cottolin pattern yarn and natural 20/2 warp and tabby weft. 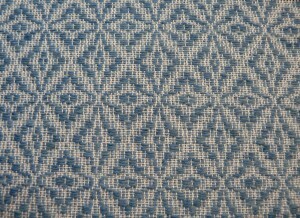 Here’s a piece with a madder-dyed 22/2 cottolin pattern weft. 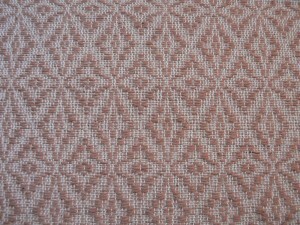 Because both of these pattern wefts are a little thicker than 10/2 cotton, the motifs are slightly elongated. I don’t mind this and I think the proportions are elegant. Unlike my last batch of books, I don’t plan to weave all of these with naturally dyed pattern weft yarns. 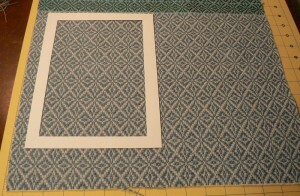 So, some will be woven with commercial 10/2 cotton and 10/2 and 8/2 tencel, and these will presumably be more square. 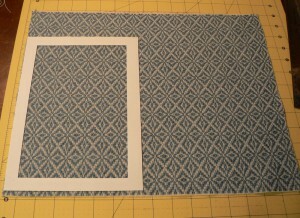 Here are two photos showing two different ways to center the motif when cutting the cloth for the book covers. In one I decided to cut through the middle of a diamond, and in the other I cut at the edge of the diamond. I glued one pair of boards each way so that even though they will be made with the same yarn, each book will be unique.